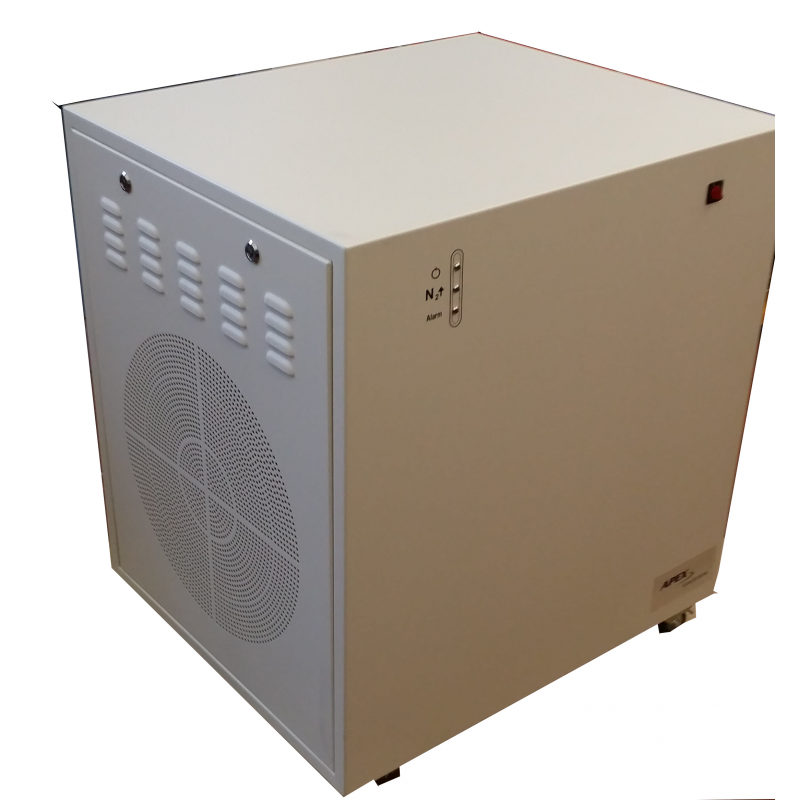 The Nevis series is APEX's range of high purity Nitrogen generators. These PSA generators produce Ultra High purity Nitrogen at flow rates of up to 25lpm. The Nevis series of High Purity Nitrogen generator is a series of discrete, efficient and modular Nitrogen generators that produce ultra high purity nitrogen only when you need it. The Nevis series uses PSA technology for superior performance and reliability. The series includes a range of models to cover most applications. When selecting a system, consideration should be given to the required flow rate, purity and delivery pressure. Additionally Apex will be happy to consult with you as to which specific model would suit you The larger units are fitted with castors to allow them to be maneuvered easily into position. Most models in the series will fit under a workbench. All of the units in the range are built on a modular design to allow the capacity to be expanded upon. Each high purity nitrogen generator in the series can be run from an external source of compressed or can be built with an integral compressor. Using an external air source air will provide almost silent operation. An integral compressor allows the system to run as a complete stand alone solution. Maintenance of your Nevis Series High Purity Nitrogen Generator is simple with all regular maintenance parts being easily acces Nevis series of High Purity Nitrogen generator is a series of discrete, efficient and modular Nitrogen generators that produce ultra high purity nitrogen only when you need it. The Nevis series uses PSA technology for superior performance and reliability. The series includes a range of models to cover most applications. When selecting a system, consideration should be given to the required flow rate, purity and delivery pressure. Additionally Apex will be happy to consult with you as to which specific model would suit you The larger units are fitted with castors to allow them to be maneuvered easily into position. Most models in the series will fit under a workbench. All of the units in the range are built on a modular design to allow the capacity to be expanded upon. Maintenance of your Nevis Series High Purity Nitrogen Generator is simple with all regular maintenance parts being easily accessible.